The Village Green Park is located at 215 E. Four Mile Rd. 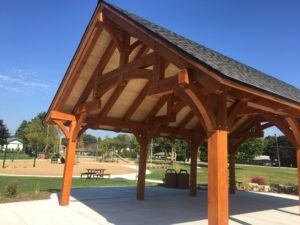 Village Green offers a pavilion, age-specific playground areas, two tennis courts, two pickleball courts, a perimeter pathway and picnic tables. The park also includes an open grassy area, suitable for playing catch or holding a special events. To reserve Village Green for an event, download the park reservation application on the Licenses & Permits page. Residents who are interested in honoring a special person or occasion can do so by having a commemorative plaque installed on a new park amenity, such as a picnic table or bench.For more information, view the Amenity Memorial Brochure . Shoop Park Golf Course is a picturesque nine-hole course located at 4510 Lighthouse Dr. on the shore of Lake Michigan. The course abuts the south lawn of the Wind Point Lighthouse and first opened in 1920. Although the park is located within Wind Point, it is owned by the City of Racine and the course is operated by Green Golf Partners. More information about the course is available at shoopparkgc.com or by calling 681-9714. The south lawn of the Wind Point lighthouse is set along Lake Michigan and is an amazing location for hosting ceremonies, picnics or other events. Click here for more information about renting the south lawn.